Dambadeniya was Sri Lanka’s capital in the 13th century. Many tourists cross Dambadeniya, when travelling from Negombo to Anuradhapura or Dambulla via Kurunegala. 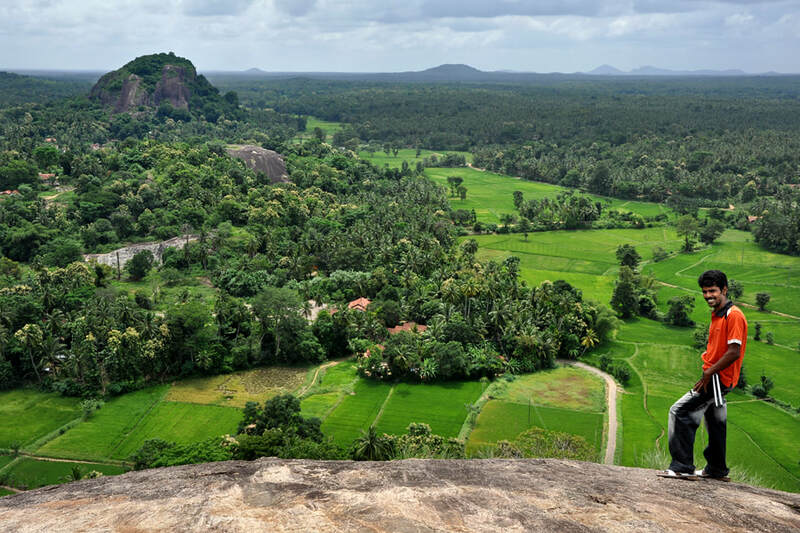 Most travellers don’t know that Dambadeniya is of historical significance and that there are two rewarding attractions in only a few hundred metres distance from the B308 mainroad crossing the otherwise inconspicuous village. Foundations of the royal palace can still be seen on a quite impressive monadnock. The rock is accessible via a stairway, which is partly from the Middle Ages. The vistas are rewarding. The main temple of the Dambadeniya kingdom, which once served as the Tooth Temple, is located in the plains 500 m west from the palace rock and 500 m southeast from the mainroad. Though some original pillars and carved stones from the Dambadeniya period are still in situ, what can be seen today is mainly the result of a restoration in the 18th century. Hence, the temple’s architecture and decoration style is typical of the Kandy period. Particularly the murals of the upper storey shrine room are excellent examples of Kandyan paintings.